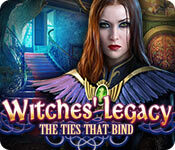 Witches' Legacy: The Ties that Bind is rated 4.0 out of 5 by 12. Rated 5 out of 5 by Kimmycoo from Abby...Nooooo I really liked this story line and I totally love this whole series. Edward and Lynn are getting married but not before that old crone comes making more trouble. This time Edward finds out he has a sister. Who unfortunately was raised by the witch. Yikes!! Abbey, Edwards sister has come to take revenge for something that is a total lie. A lie that the witch has fed her for years. That Edward is responsible for all the mess. I loved the scenes, the game play and HOS, mini games all that good stuff. I did have to use the strategy guide once as I was missing an item. The hint system would not show me where to go. I had left something behind and the hint couldn't figure it out, so I had to go pull up the walk-through. That was annoying. Either way I love this series and as always I love the lil imp/dog thingy!! Rated 5 out of 5 by oO0AdATbF from This is one great HOG, my friends. Had a lot of fun playing this one and I'm certain I'll play it again. Really outstanding artwork, plenty of HOs, custom level, transporting map and a small assistant that is entertaining rather than cloying. I found this to be an exceptional episode in the very cool Witches' Legacy series and I highly recommend it to HOG devotees. Rated 5 out of 5 by Poipoi15 from This game is really worth the money and time! You will have a great time with this game. Lots and lots of HO's and really fun mini-games. Rated 5 out of 5 by pennmom36 from Seems As If Lynn And Edward Will Never Tie The Knot! Witches' Legacy is one of my favorite ongoing saga's that began when you saved a young witch named Lynn from Elizabeth's evil grasps and raised her as your very own. Lynn has since used her powers only to help others, and she fell head over heels in love with Edward, yet was betrayed by him when Edward was working with Witch hunters to rid the world of all Witches including Lynn. True love prevailed, and Edward realized that Lynn would never use her powers for evil and finally they will say "I do" this weekend! But that wouldn't be a very exciting story, so it turns out that someone has informed Edward that his parents are alive, and that he has an older sister named Abigail! Naturally Edward decides it's a great idea to investigate this information just before the wedding, and heads to the Oldhills Orphanage alone. Thankfully Lynn smells trouble and sets out to save him and meet the in-laws! That half pint Imp has once again climbed aboard the inventory bar to lend a hand with his unique skills and abilities to retrieve items just out of reach. I never understood why he doesn't have a name by now, he's simply referred to as Imp. There are + indicators for some inventory items requiring you to open, repair or combine that item with another inventory item. 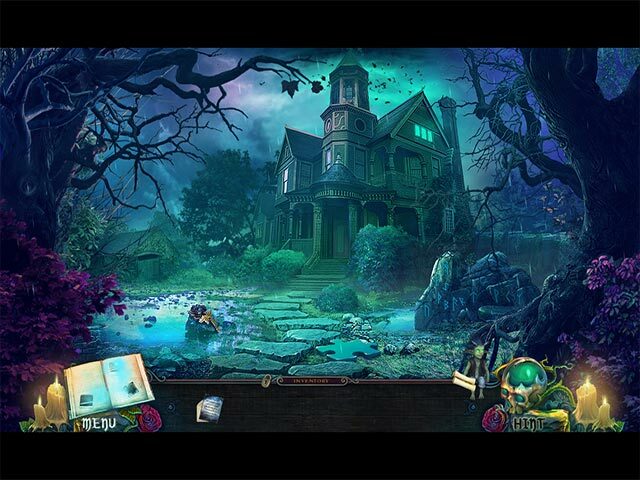 The Hidden Object Scenes are varied, but they all seem to be interactive list finds only, but I haven't completed the game yet. In the first HOS, the list was covered in leaves so you need to find a broom first to sweep away leaves from the list, another had parts to a meld hidden behind each item that you found and once the meld was complete you poured the molten metal into a key mold which fit the drawer lock exposing the final item. I must admit that some of the mini games were the frustrating type, the one where you flip a long box over vertically and horizontally, navigating through narrow openings until it's lined up to flip into a specific square opening, I skipped this after the second set so not sure how many times this was repeated. There were also easy games such as dropping balls down tubes until you fill each color coded tube with the matching colored balls. Personally I favor the Collector's Edition which has all the goodies you could ever want. 35 Morphing Objects (my favorite feature) 35 hidden Jigsaw Puzzle pieces which will unlock Mini Games, 10 Collectibles Toys for Imp, Achievements, Wallpapers, an Art Gallery, Screensavers, Soundtracks, an Imp room, a Bonus Chapter and a built in Strategy Guide, enjoy! Rated 5 out of 5 by biscuitsmama from An Excellent Addition to The Witches' Legacy Series In Witches’ Legacy The Tie That Binds - the 4th game in this series – Lynn and Edward are about to be married when Edward suddenly goes off on a search related to his family. Lynn suspects it is a trap so we are off and running to save Edward and find the truth about what happened to his family. With our friend Imp in tow, it looks like we may have a sometimes dangerous and rather entertaining time ahead. The graphics follow that same style as in the other Witches’ Legacy games and although very good they are not really crisp. I think that the artwork is really very good with a varied color palette; however, the pink, blue and purple tones have been used too much in recent games. The voiceovers are much like those in the other games in the series but Lynn’s voice seems rather stilted and flat for a young woman who is approaching her wedding day. Although the voiceovers may leave a bit to be desired, the other sound effects in the game are excellent, particularly the thunderstorm at the beginning of the game. You have a diary that keeps track of the story and other information you might need at a later point in the game. Early into the game you will piece together your interactive, transporter type map that shows areas of interest and other information as well. Of course you have Imp to help in situations, and trusty friend is always ready to go with just the click of a mouse. There are various types of interactive HOPs to be found but most are the list type. If you don’t want to search through junk piles to find objects on the list, you do have an alternative matching puzzle to play. As I have mentioned in other reviews, developers now include puzzles that seem very easy with less challenge to solve. 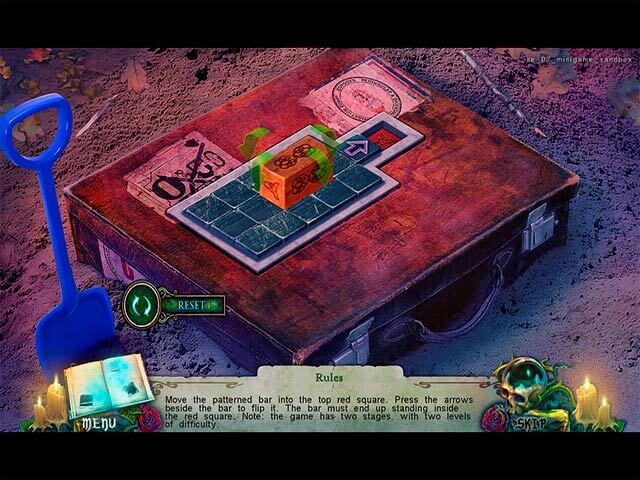 This is a trend to perhaps attract some of those who don’t like puzzles in HOPA games. Did I like the game? Yes!! 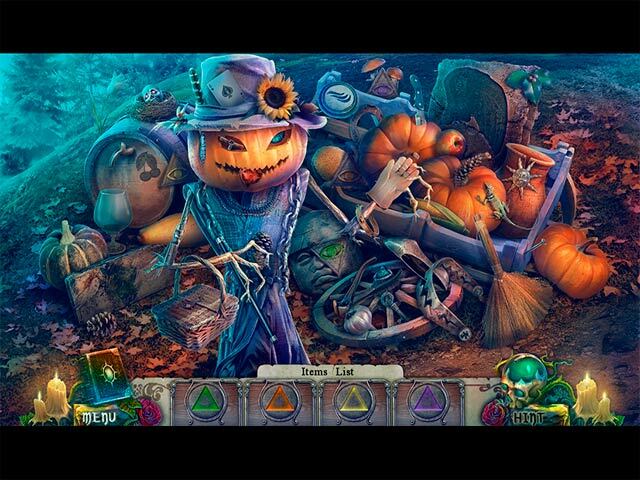 The game turned out to be a real winner and it is one I will play again, which doesn’t often happen with HOPA games. I was very surprised because I thought the game seemed a bit boring in the beginning but the excellent HOS and the puzzles kept me entertained for two days. The game is a bit longer than I suspected, and I spent time looking for all the morphing objects in the CE version that I purchased. I would highly recommend The Tie That Binds for anyone who loves a good HOPA. This is only my opinion so as always, I recommend that you at least try the demo to see if this is a game you will like. Rated 4 out of 5 by grammakk from poor edward this poor guy didn't get much air time in this game..poor guy. lol. game was okay no big bells and whistles but enjoyable . did not like the wayyy back running to get a small item that was annoying. good sound i turned it up to get involved in it better. happy to see imp again though he pretty much stayed out of it i thought this time. try before you buy as i say but no regrets buying this one. Rated 3 out of 5 by Italia47 from An OK game that didn't knock my socks off! What can I say, not a bad game, and the Witches Legacy series is quite good, but now I think it's time to move on. I just finished the SE version and I did like the ending. The mini-games were easy and elementary. Sound was good, artwork very good but not outstanding. But the game flowed okay it's just that it's the same old, same old. Voiceovers were very good, however. I felt there were too many HOS but for a change of pace, I did play the match game which is offered. So that was a good thing. But this game didn't wow me as I thought it might. For it's genre, it's good. Well-organized game, flow was all right, game plan is the same old, same old. Mini-games weren't as innovative as some other games. As for Abigail, Carrie, Lynn, Edward, Elizabeth, devs put them to rest now. It's time! For me this was a good game to play when you have nothing else to do and it's raining outside. I still recommend it. It did receive some five-stars and that's fine but I don't think it warranted a five-star but a three. Rated 3 out of 5 by xhelenabasketx from Not my favorite of the series. The game worked great. No bobbles at all. Graphics and sound were great. There were too many HOG's and I found myself getting bored with it. Hopefully the others in the series will be better. I recommend it for more of a beginner player.